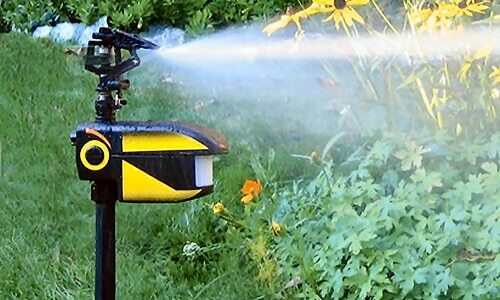 Do motion sensor sprinklers work – How to get rid of raccoons, cats & dogs in the backyard? How does Motion Detection Sprinkler work? How to keep Raccoons away from your house? 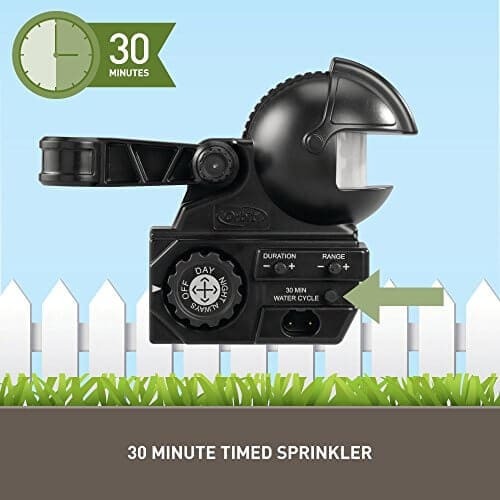 Where can I buy the Orbit 62100 Yard Enforcer Motion Activated Sprinkler? Absolutely. Not only do motion sensor sprinklers do work, but they provide immediate relief from critters and the satisfaction of having a reliable tool against them, and animals are smart enough to learn that your property is no longer their territory. 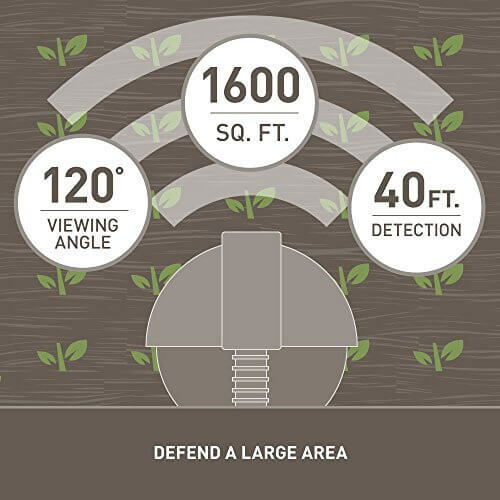 Using a motion sensor sprinkler for a short period of time may be enough to provide you with long-term results. After about 3 months of tweaking the angles and leaving the sprinklers on 24/7, I removed them to see what would happen. To be honest, it’s kind of annoying to step onto my own yard and get shot with water. It’s now been 6 months since I removed the sprinklers and I’ve only found one pile of poop, which was from a different neighbors dog. No cat or raccoon trouble though. I guess they have decided to move elsewhere. Update: I now recommend the Orbit Yard Enforcer because the newly restocked scarecrow has quality issues, it is not the same as the older model. How does Motion Detection Sprinkler work? How to keep Raccoons away from your house? The concept is simple. A powerful sprinkler is pointed towards a target area (e.g. a vegetable garden) to protect it from any sort of wildlife interference. As soon as a critter moves into the monitored spot (a built-in sensor tracks movement and body temperature) the sprinkler is triggered and shoots a quick burst of high-pressure water across the entire target area. The sprinkler’s radius, as well as the height of the water spray, can be manually adjusted. The raccoon, deer or skunk gets sprayed and a good scare. The sudden and noisy activation of the sprinkler gives the animal an adrenaline shock, immediately putting them into panic/survival mode with the only option to run. Once they undergo that stress for two or three times they learn to stay away. The first thing that I personally have appreciated highly is the material used to make the product and the design on the whole. Metallic and hard construction makes sure that neither wind nor enemies would be able to remove it from its place. The design is up-to-date, matte black color won’t attract unnecessary attention and will permit the device to frighten enemies imperceptibly. There are 3 solid reasons for why I’ve chosen this brand and model. There is a battery section right under the sensor. A good pair of 4AA batteries offers the device an economical usage and can last for 7.500 cycles. So even it if goes off 10 times a day, the batteries can last up to 2 years.The unit is very power-efficient. Outside the construction, there are regulator buttons – levers of watering duration and distance. So you can change the distance and water duration. The switch of timing offers the following modes: “day only,” “night only,” “always on,” and “off.” This option to use the device on the specific part of the day is a huge plus. There is also a “patrol” mode – that allows for watering every 30 minutes. Though in my opinion, this last mode isn’t very realistic, it wastes water and animals are clever cunning creatures, that adapt quickly to watering timing. 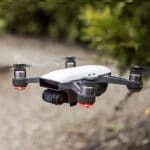 The Yard Enforcer’s passive infrared motion sensor detects animals from up to 40 feet away even at night, and its “smart” sensing technology learns the difference between trees and animals to prevent overwatering. The sensor detects a combination of both heat and movement to activate the valve. You can adjust the sensitivity of the sensor and the duration of the “activated” spray. 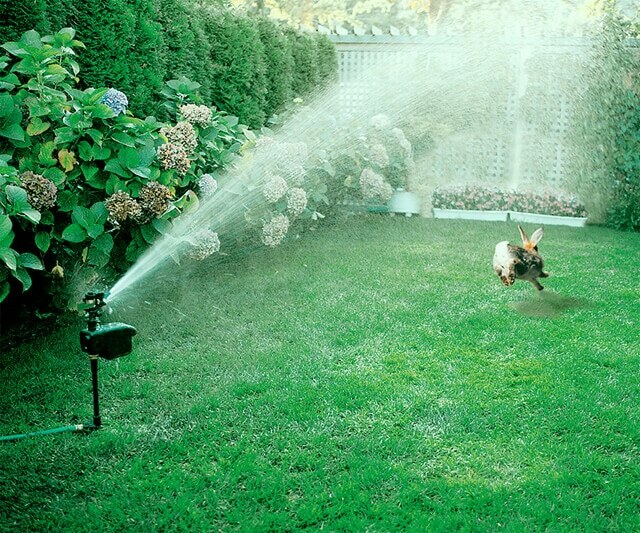 A 30-minute cycle also enables the Yard Enforcer to function as a timed sprinkler. 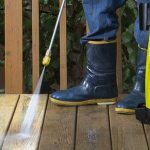 The metal dual-step spike with brass hose swivel penetrates the soil easily. One of the top complaints about motion sensor sprinklers is that they leak or that the thread on the hose connect break over time. This is not an issue with the Orbit models as they are made of thicker plastic and metal parts. I can confirm this at least in part, because from the video below, you can see that the hose connection port has a brass lining, meaning you will get a more solid, long-lasting connection to your garden hose. Two of the most common complaints about motion sensor sprinklers is that it leaks, and that leaving the hose connected (while on) for an extended period of time can actually strip the threads. This won’t be a problem for the Yard Enforcer. The Orbit 62100 Yard Enforcer Motion Activated Sprinkler is one of the best in keeping animals of all kinds out of your garden and yard. Other units just simply can not compare to this motion sensor sprinkler in terms of simplicity and control. It can also be noted that deer fences and netting are expensive and inconvenient at times. That is why this is one of my favorite options for a variety of animal control situations. 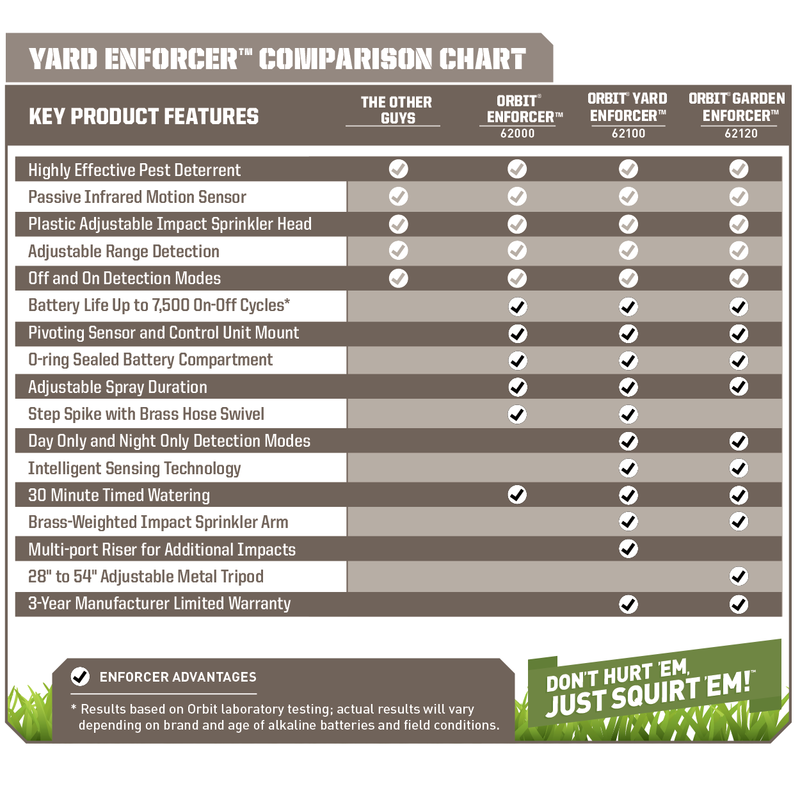 The Orbit Yard Enforcer provides you with a proven way of protecting at least a 1600 square foot area. For effective control of cats, birds, dogs, and other pets you don’t need to hurt them just squirt them. The sensor is reliable and I can easily adjust the sensitivity of the spray radius. The sprinkler is built with good quality materials (Contech) and can handle the constant water pressure. I can hook up several sprinklers within one water line (daisy chaining is possible). I do have to point out the importance of using a heavy-duty hose (like the Never Kink hose) to connect to the Scarecrow in order to minimize the risk of leaking. Within days I had to replace a flimsy hose that couldn’t take the constant water pressure. While I was waiting for the new hose to come in the mail, I actually turned off the system and I noticed that the garden still remained untouched for those nights. The raccoons have been conditioned to refrain from entering my garden area. It leads me to believe that I should be able to move the sprinkler occasionally to cover additional spots to keep the raccoon on its toes while expanding my protected area. Once I connected the sprinkler to the heavy-duty water hose it has been without a leak ever since. This model is very easy to set up. 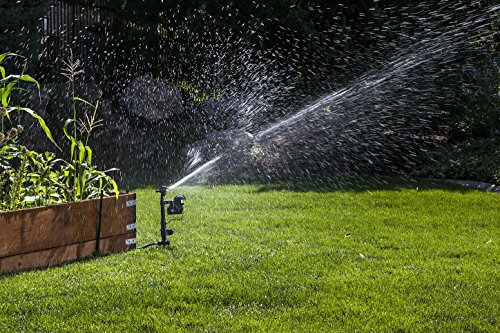 It requires one 9-volt battery to work and detect motion.Once the battery is inserted, you connect the garden hose to the base of the sprinkler. One battery lasted me almost 3 months, with sprinklers shooting 10-20 times or more each day. When a battery starts to run out, you’ll notice that reduce detection range and the spray distance is not as far. Make sure the cap is secure on the other end because there is a second port that you can connect a hose to in case you want to chain several sprinklers together. The downside to this is that if both sprinklers go off (which can happen easily if they spray in a similar direction, ie triggering each other) you will get less of a spray distance due to lack of water pressure. 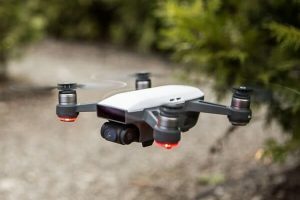 Originally, I purchased 4 units, each for $50 a piece, but the current model seems different from the older model, there are lots of feedback on the quality issues on the newer model. My no 1 recommendation now is the Orbit 6100 Yard Enforcer because it is a similar design to the Contech, but also comes with day/night sensors and is made of higher quality material. I was quite happy with the results I got from the Contech Scarecrow. The only frustration for me was that I could not get a proper angle in my front yard to deal with all the non-cat movement. If I place it facing the neighbors’ yard, it would go off when they got home. If I place it facing the street, it would get triggered by cars driving by. Reducing the sensitivity helped these situations, but then they wouldn’t go off when cats strolled by. Regulation of Scarecrow Sprinklers occurs on 3 levels. Firstly, the directions indicate the water pressure you should use. Secondly, adjust the arc of the spray coming from the sprinkler. This is done by changing the position of stem tabs on the sprinkler unit. Finally, there’s a knob on the sensor housing that determines the sensor’s sensitivity. On all 3 levels, regulation is fairly intuitive and just requires a bit of practice. It took quite a bit of tweaking to find a happy medium but was possible with two connected units. 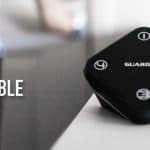 It is inexpensive, easy to use, there is a motion sensitivity adjustment knob to adjust the sensitivity. There is also a spray distance adjustment knob and it is good at scaring animals with noise and water spray. It can be too sensitive to the wind, might trigger by passing cars, if you place it facing the street. It is made of plastic, water leaking might cause the soil to loosen and fall off. It is not automatic so you have to turn it on when you want it on. There is a switch in the back that you turn to the ‘on’ position at night and then it will be activated by motion. Turn that switch off in the morning and then it will not be affected by any motion. The construction material for the Orbit is much higher quality compared to ScareCrow. The Orbit Yard Enforcer is clearly an improvement over the original design of the Scarecrow. Unlike the Scarecrow, the Orbit Yard Enforcer has a really convenient Dusk to dawn feature which saves considerable battery life and eliminates me having to go outside every morning to turn the device off. 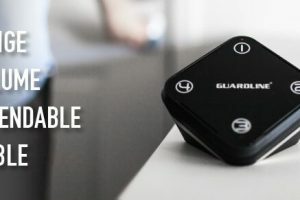 The Orbit Yard Enforcer also has an adjustable motion sensor which allows you to tilt the sensor up for large animals or towards the ground for smaller animals. In order for a motion activated sprinkler to be an effective raccoon or other animals deterrent, you must have enough of them to adequately cover the access points. Since writing this post, I had to increase my coverage and buy an additional one because the raccoons began to penetrate my perimeter again. They had found an unprotected way in along that back wall I was concerned about. The other point I want to add as an update is that you should occasionally move the sprinklers around. The raccoons or other animals will continue to probe for entry points. By moving the sprinklers around, you will catch them off guard when they memorize where the sprinklers used to be. Does a Motion Sensor sprinkler work in darkness? Will it work in winter when there is snow everywhere? 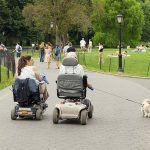 Probably it will work even better since the temperature of the air is lower and the sensor of motion would catch the warmth of an animal’s body more easily. Just make sure for the sensor to be positioned sufficiently low in order to be able to recognize even small beasts. As for winter: you won’t be able to use the device in cold season since it has to be linked up to a hose and water in it will be frozen at any rate. How do I know it’s time to change batteries in a Motion Sensor sprinkler? Periodically check the strength of water spurt, if it weakens, it’s time to change batteries. Can I use a Motion Sensor sprinkler not to repel animals but to water a lawn? No, for Scarecrow because the installed motion sensor doesn’t permit this. Yes, for Yard Enforcer. 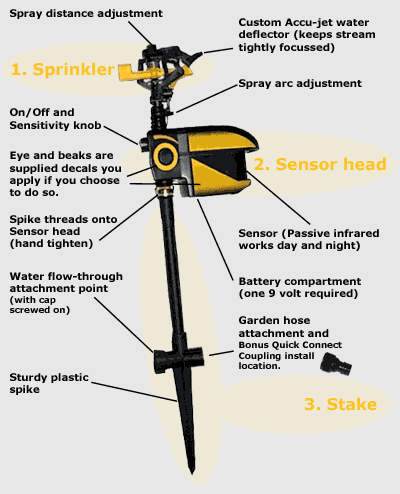 It has a 30-minute cycle mode, that enables the Yard Enforcer to function as a timed sprinkler. Does the sensor of motion in this device respond only to the appearance of an animal or a person as well? 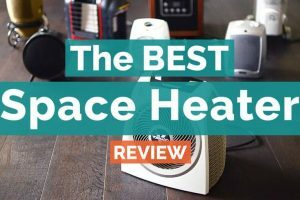 This device responds to any warmth emitted either by an animal or a person. But you may customize a sprinkler as you need, choosing the required trajectory of action, then the water jet will not touch you. 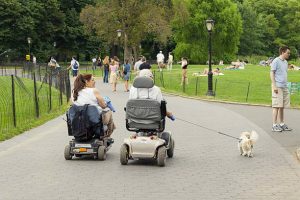 For example, don’t direct the device towards the paths you tend to go, and it will be ok. The Orbit 62100 Yard Enforcer has a powerful infrared sensor, that can detect intruders from up to 40 feet away and has a wide viewing angle of 120 degrees. How to best mount the Motion Sensor sprinkler? Since the ground near the device would get wet, you can’t simply put it on the ground and go away. If the ground is rather compact, dig the device into it for the depth of some inches. It will be enough for it to stand firmly. If the ground is soft, take a flower pot (sufficiently big) and have the device planted in it. Place dirt or gravel inside the pot. 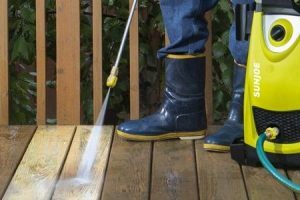 Check if there are no leaks, otherwise, you may get another pest problem — mosquitoes. How sensitive is the detector of motion? Can the rustle of leaves impact on it? It is quite possible if the wind is strong and the trees are near. Don’t place it near trees to avoid such situations. 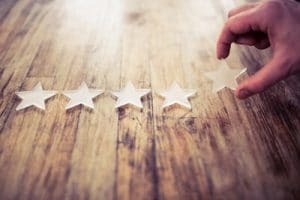 How long is the service life of batteries? It depends on the activities of animals in your garden. Of course, if there are hordes of them there, the batteries will last only for some weeks. However, if the activities are moderate and minimal water “shots”, the batteries will be sufficient for 3-4 months of surveillance. Does the Motion Activated Sprinkler deter other animals as well? Yes. The Yard Enforcer not only solved the problem of how to get rid of raccoons, it also repels deer, rabbits, cats, dogs, possums, and squirrels from your backyard, pond, or pool. However, if the raccoons are persistent. do keep a supply of batteries to power the unit and to keep them away. And inspect your fence from time to time. They will keep trying to find a way in.